In our most recent refresh of our Guitar Tricks review, we took a look at what had changed in 2019. The popular platform hadn’t made any huge alterations, although their new lesson page format was now in place, along with a few other content tweaks. We’ve made changes to our opinions and ratings to reflect these. Year after year we continue to rate GuitarTricks very highly. The reason? It remains one of the most comprehensive online guitar tutorial sites around today. For complete beginners, intermediates and advanced players alike, GuitarTricks still proves to be the system to beat, with over three million people using the site to improve their guitar playing. Like anything in life, the website is not without its flaws. However – being one of the oldest tutorial sites around, having launched in 1998 – GuitarTricks has had plenty of time to iron out most of the wrinkles. Plus, with such a long history, they can boast an archive of more than 11,000 lessons and 700 songs to learn. With over 20 years’ experience, it’s clear that GuitarTricks knows a thing or two about teaching guitar online. So, let’s see what’s new in 2019. Disclosure: We are a professional review site that receives compensation from companies when you click on our links pointing to them. However, our reviews are unbiased and we are recommending only the courses we believe are worth your time and money. This is the only way we support our site, instead of bombarding you with ads and banners. Thank you for the understanding and your support! The format of the lessons on GuitarTricks is very simple to get to grips with, especially after a newly revamped lesson page design. Taking center stage is the video player, which is excellent. It’s simple to adjust the video quality (from 224p right up to crystal-clear 4K), guaranteeing the highest resolution for you – even if you play the videos on a big screen, via a HDMI cable or internet TV. This video player also features an accurate A/B looping system, allowing you to repeat a full video or a specific portion continuously – crucial when learning a difficult song. Another essential tool is the speed setting bar, which allows you to adjust the speed of the video down to 0.5x without affecting the pitch, which is handy when playing along to the song. You can also speed the video up if you like a challenge! Next to the video – where relevant – you’ll find the TAB/notation for the song. This is an intuitive location, meaning there’s no need to scroll down for the TAB then back up for the video – especially as the TAB scrolls automatically to the video. This means you can just press play, pick up your guitar and focus on the lesson itself. Under all this you will find the lesson information and even song lyrics where appropriate. The lessons themselves vary in length and come in a series of individual segments, instead of one long lesson. This makes it easier to learn a tricky solo for example, as you can head straight to the desired section without having to watch the introduction and other aspects of the song multiple times. To highlight this, take the lesson for ‘It’s Not My Time’ by 3 Doors Down, which breaks the song down into its introduction, verses (both clean and distorted), chorus (both clean and distorted), octave riffs and solo, while there are also segments for finding the right gear and tone for the song, as well as a full performance video so you can play along. If you are a complete beginner, GuitarTricks is a very solid platform, easing you into the instrument nicely. As one of the four main categories on the home page, the ‘Beginner Lessons’ section is easy to navigate to. When on this page, you can work your way through their Core Learning System. Start on the ‘Guitar Fundamentals Level 1’ course, which teaches the guitar essentials – from how to tune the strings to playing simple chords, simple melodies and lessons on rhythm. The good news is that you will learn how to start playing instantly, with instructor Lisa McCormick holding your hand right the way through. She is a good teacher, who is friendly and easy to follow, but doesn’t come across as too patronizing. This is more than enough material to keep you playing for a few weeks, and as much – if not more – than you may learn with a face-to-face instructor. Moving onto Level 2 just picks up where you left off in the first level, showing you how to play and use power chords, barre chords, different scales, and even an introduction to reading music. If you have never picked up a guitar before, this foundation course will teach you to play songs from day one, allowing you to become a competent player in a matter of weeks. While GuitarTricks offers a very comprehensive beginner’s online course, what does it offer more experienced players? Sticking with the Core Learning System, advanced players can explore the foundations of three different styles of music: blues, country or rock. There are two levels per style, with the introduction of new instructors. There are ample lessons to get anyone started on the road to a new genre of music, outlining both rhythm and lead playing techniques, as well as how to find the correct tone with different equipment. While the later stages of the Core Learning System will benefit the majority of experienced players, the true highlight of GuitarTricks for experienced guitarists is their bank of songs, which spans more than 700 (more on these below), over a range of difficulties. These difficulties are categorized by a small guitar scale: one guitar for ‘Absolute Beginner’ working up to five guitars for ‘Advanced’ songs. The trio of styles – blues, country and rock – highlighted in the Core Learning System may be the most popular, but they are by no means the limit. In fact, GuitarTricks also includes dedicated sections on the majority of guitar styles: acoustic, bluegrass, classical, funk and soul, jazz, metal, rockabilly, surf, and world. 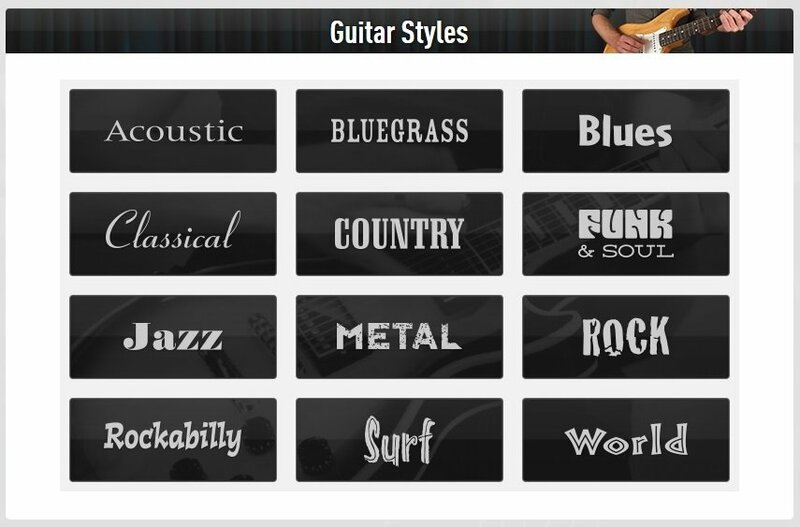 You can navigate to these different styles directly from one of the four main categories on the home page, ‘Learn Styles of Guitar’, although they are also listed throughout the site when browsing songs. Unfortunately for bassists there are still no dedicated bass guitar lessons available on GuitarTricks, as they focus solely on six-string electric and acoustic guitar. Who knows, in the future this may change, as the site tends to regularly update their offerings, but – for now – bassists are out of luck. As you may expect from a site that has been running for two decades, GuitarTricks features a huge roster of instructors – 32 at the last count! They all vary in age, gender, and style, with some specializing in one genre (such as Ned Luberecki for country, and Kenny Echizen for funk), while other instructors will pop up teaching many different styles. For example, Doug Fearman takes lessons on blues, rock and jazz. All instructors come across as knowledgeable and friendly, although some perhaps a little more enthusiastic than others. The majority of instructors have played and recorded with artists around the world – Andy Gurley, Jinx Jones, Michael Eisenstein, and Henrik Linde in particular, while Sharon Aguilar is the lead guitarist for Cee Lo Green, and Anders Mouridsen has performed with the likes of John Fogerty, Taylor Swift, Faith Evans, and Pink. Other instructors such as Dave Celentano and Tom Finch are renown across the industry for their playing and teaching skills. So, it is a varied bunch of tutors, all with a good pedigree. As we have mentioned, GuitarTricks boasts a huge collection of officially licensed songs to learn – the biggest of any tutorial site, with more than 700. They also promise at least one new song added weekly, although sometimes more often. The songs you can learn on GuitarTricks are a big mixed bag – everything from The Beatles to Blink 182, Pearl Jam to Poison. Every style of guitar music is covered including a range of classical guitar pieces, with Bach, Beethoven, Pachelbel and Tarrega all well represented. Whether or not your favorite band is featured is the luck of the draw (and possibly something to do with licensing issues). For example, some huge artists do not feature at all, while some smaller artists feature heavily. The choice of songs for some of guitar’s most beloved icons are also a little limited – for example, there’s just one Metallica track, two Eddie van Halen tracks, and nothing from Steve Vai or Joe Satriani. Those wanting a taste of these megastars can find ‘style lessons’ where an instructor gives a lesson or study in the style of Maiden, Hendrix, Vai, Satriani and so on, although if you are looking for specific songs you may be disappointed. Having said that, with more than 700 songs in the GuitarTricks bank, as well as hundreds of style and technique lessons, there is more than enough to keep both beginners and experienced guitarists playing for years. Since our last review, GuitarTricks seem to have ditched their previous Full Access Plus/Pro subscription service, which allowed you to have three group sessions with an instructor every week. Instead, the platform now offers more flexible one-on-one online coaching sessions, at either 30 or 60 minutes in duration. This is a bonus feature that will certainly bump up the price you pay overall, but it’s a convenient service if there’s a particular song or technique you are struggling with and want expert tuition tailored to your needs. The fact you can have a one-off lesson is great – there’s no need to subscribe to something you aren’t going to use long term. In addition to its lessons and songs, GuitarTricks offers a helpful toolbox, featuring a range of basic web apps that are essential for both the beginner and experienced guitarist alike. The nine tools comprise a metronome, a reference tuner, a scale finder, a chord finder, a jam station, and a fretboard trainer, as well as three new additions: chord charts, a tab guide, and a glossary. While these all vary in their degree of usefulness, the fretboard trainer in particular is an innovative way to find your way around the fretboard. It is a straightforward game that randomly highlights a note on the digital fretboard, offering a range of multiple choice answers and a timer. You just have to tell the system what the note is. Simple in theory, but actually quite addictive to play and a fun way to learn your notes. While the majority of these tools may be something you already have, it’s very convenient to have them in one central location – close by when you are learning your songs. All these apps operate very well. They are aesthetically pleasing and overall easy to use. Not deal breakers, but good additions. In addition, GuitarTricks also offers a regularly updated blog that is available to both members and non-members alike. Blog authors talk about a plethora of different topics and share interesting guitar-fueled lists – such as ‘10 Easy Guitar Songs for Beginners’ and ‘11 Most Innovative Guitar Brands You’ve Never Heard Of’ – as well as interviews with instructors, gear reviews, announcements, special giveaways and competitions. As is now an essential offering for tuition sites, GuitarTricks provides a free iOS and Android app, so you can take lessons on the road. The free version of this app offers a range of free lessons on rotation, although you are very limited in choice. However, if you upgrade to full membership, you will have access to all the content GuitarTricks has to offer. On both platforms, the app itself is nicely designed, and as smooth as the website to get around. You are offered a simple dashboard, which makes navigating to songs, styles and lessons very easy, while the videos retain the same high-quality resolution as you would find on the web version. GuitarTricks nurtures a full forum for their users, offering you the opportunity to chat with fellow guitarists of all levels, ask and reply to questions, and see what other guitarists are up to. With dedicated sections on guitar basics, music theory, songwriting, recording and technique, among many others, there’s something for everyone on this easy-to-use forum. The guys at GuitarTricks are also very active on social media networks including Facebook, with nearly half a million followers. They post regular guitar tips and videos, and even giveaway the occasional free lesson. Their Twitter page – @GuitarTricks – is also a lively stream, keeping followers up-to-date with what’s happening on the website and blog. There are two choices when it comes to payment. You can either pay $19.95 every month for a GuitarTricks subscription, or an annual fee of $179.99 (which saves you $60 in the long run). It’s certainly not the cheapest tuition site out there, but – when you consider the depth of tuition available – the value for money is excellent. Ultimately, if you were paying a private face-to-face tutor, twenty bucks a month wouldn’t get you very far. For such an extensive course that pretty much guarantees you will make progress with guitar (providing you actually practice! ), there is a lot of worth in a subscription. The good news is that GuitarTricks has a very generous permanent promotional code, which will save you 20% off your first payment, whether you are paying monthly or annually. You can manually enter the code SAVE20 or visit this page where the coupon has already been applied. For curious readers, the good news is that GuitarTricks does offer a generous 14-day free trial, allowing you to thoroughly test the platform. This proves a risk-free way to see if the format and lesson styles suit you, and whether full membership is worthwhile. And they don’t hold anything back – you are able to access to everything a full member would, free for two weeks. If you are a complete beginner and have never even held a guitar, you will want to start with Guitar Fundamentals Level 1 as part of the GuitarTricks Core Learning System. As mentioned above, this course will teach you how to hold the guitar and plectrum, right up to learning your first basic chords and songs. You can then progress to the slightly more advanced – but still beginner friendly – Level 2, where you’ll learn power chords, barre chords, and be introduced to both major and minor scales. If you are an intermediate or advanced player, you can start pretty much anywhere. We suggest diving into a few of your favorite songs to get to grips with the lesson formats and video player. Then you can start on a short course to try a new genre of music – Blues Style, Country Style, or Rock Style courses are all part of the Core Learning System. It is genuinely hard to fault GuitarTricks – the company has been around for nearly two decades and have finetuned their system to near perfection. The amount of songs and lessons on offer really impressed us, especially when compared to the limited selection on some of the other online guitar lessons. The group of instructors are talented and friendly, while the feature-rich video player and website are easy to use and navigate. It is also good to see the newer videos filmed in 4K, highlighting every pluck of every string. In truth, there are very few weaknesses. Perhaps the song choices are a little arbitrary, with some more popular bands and iconic artists poorly represented, while others – who are less popular – have a bigger catalog. There are also no bass guitar lessons, which is a shame for wannabe bassists or those who play both instruments. However, for less than the price of a large pizza per month, GuitarTricks offers great value for beginners and experienced players alike. A free trial is the least you should check out. It’s clear this is just an advertisement for guitartricks parading as a ‘review’. As you can see our site has 0 advertisements, pop-ups and all the annoying banners that you can find everywhere else – this is because we support our site by referring people to the products that we recommend. If you take a look at the sidebar you can also find the disclosure. Thank you for your comment and for supporting us! I am very happy with the teaching model. I am 75 years old and feel like a kid at school when go through the lessons on my computer. I am still in the 4th chapter but confident that it will be a good experience all the way to my first concert. Sorry but if you’re receiving money from Guitartricks.com, how can I believe a word of this? There is nothing critical written about them at all. I need to search for another more independent review it seems. Having used GuitarTricks for a while, there isn’t that much to criticise if you ask me. They do lack a few songs from well-known artists, but the lessons are great value for the price. It’s probably why they give it such a good review. Well there is a free trial, so make your own mind up. That sounds like a bargain !!!! Dave, I know the YAYMAY $99 discount rate has expired. Is there a current one? We will get in touch with GuitarTricks on your behalf and try to help you get all of this sorted. I believe it was some sort of customer support mistake. Do you mind sending us your account details on GuitarTricks? Use our contact page and email us your orders, account id and email used for registration on GT. The free-trial membership doesn’t allow access to song lessons.